alive the joy for the June meeting I had with you in the various prayer groups. explore together the message of divine mercy that the Lord Jesus has given to the Church through Saint Faustina Kowalska and Pope John Paul II. The more we let ourselves be attracted within this ocean of grace and understand the importance of working more seriously with our Mother Mary for the salvation of souls and to bring men and women at the heart of Christ through the Immaculate Heart of Mary Queen of Peace . Bring in the world, in our families, among our friends, this message of hope and peace. God never tires of man in Christ and through our poor people, continues to seek the lost sheep that is likely to be lost forever in despair, instead of achieving peace and boundless eternal homeland of the blessed paradise that awaits us to give us an eternity of fullness of life and love. I also want to thank all those who are supporting our missions and to invite you to continue. The needs are enormous. At this moment I am writing from Brazil, where we have, as you know, in March opened a mission that welcomes eighty children, working with the mission of Caritas sister always Franciscan, founded by Father Urban Pittiglio ofm which houses more than five children. 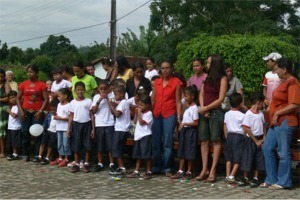 Much of our work to help these children, it depends on your help and your generosity that surely will not fail. To all of you a warm greeting along with my priestly blessing and the promise of constant prayer for you all.